Ford Co-Pilot360 is the automaker's answer to drivers' growing concerns about navigating congested traffic and dealing with unforeseen distractions while driving. We here at M & M Ford Lincoln are thrilled about the entire suite of driver-assist technologies. Here are two technologies we look forward to sharing with you in detail. Blind Spot Information System (BLIS) alerts you with a side-view mirror indicator light after a radar detects a vehicle that enters your blind spot. A similar cross-traffic alert gives you a heads up if a vehicle crosses behind you as you're backing out of a parking spot. Automatic Emergency Braking (AEB) also keeps you safer. 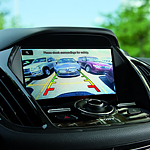 Newer Ford models use AEB as a last safety resort to prevent unfortunate head-on collisions. AEB is part of a pre-collision assist system with pedestrian detection. With pedestrian detection, warning flashes and alert sounds transpire after detecting a vehicle or pedestrian crossing in front of the vehicle. If the driver fails to respond to the warning flashes and alert sounds, the AEB automatically deploys. Ford Co-Pilot360 is slated to be standard on 90 percent of new Ford models by end of 2019.